The main spiders of the rainforest to fascinate Darwin were the social spiders. 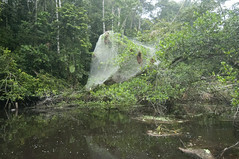 They can build large webs engulfing entire trees and work together to bring down prey many times their size. In the Amazon, these spiders can easily be spotted in hammock shaped webs along tributaries of the Amazon River. Sociality is not restricted to Amazon rainforest spiders but the most often studied is a Neotropical species named Anelosimus eximius.